Frozen Head State Park is a highlight of the Cumberland Trail/Great Eastern Trail in Tennessee, and it is home to an infamous marathon. 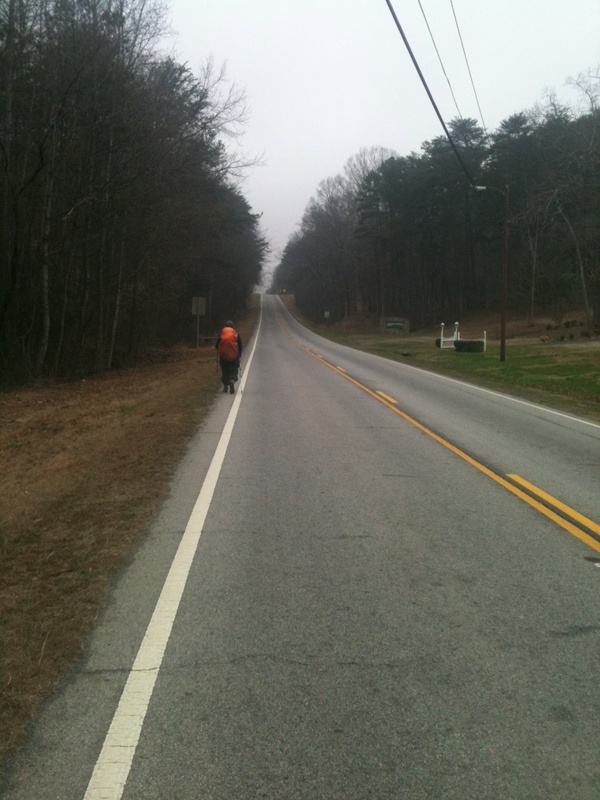 A film has now been made about Barkley Marathons. An article about this event and film recently appeared in Outside Online. You can buy the documentary here or just watch the trailer: barkleymovie.com. On Valentine's Day in 2013, the Cumberland Trail's Grassy Cove Segment didn't yet connect from Brady Mountain Trailhead to Black Mountain Road. A group of volunteers was building trail in that section that day. We were able to follow flagging to get between the two sections that were already built. This end of the trail is no longer the end thanks to volunteers. 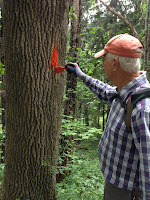 Pictures and maps of the now-connected Grassy Cove Segment are available on the Cumberland Trail Conference website. the Great Eastern Trail. FYI. If you're interested in hiking all or part of the GET, there's a new Facebook group for informal, friendly discussions. 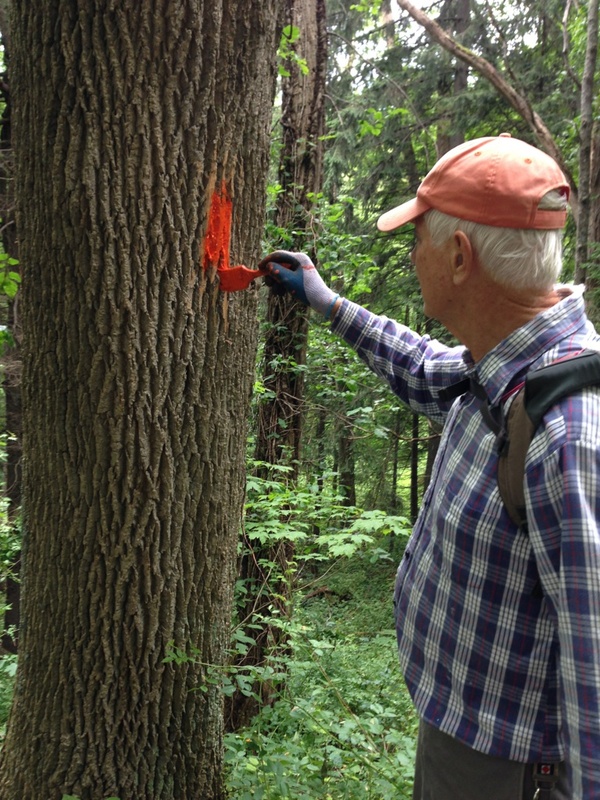 Join us over at Great Eastern Trail Hiking! Fantastic news from Kentucky! Senator Jones has withdrawn the bill that would have destroyed the Pine Mountain Trail, which hosts the GET. From the article: With the loss of jobs in eastern Kentucky in recent years, "(w)e have to find ways to create economic activity, help local businesses and one way is to grow adventure tourism," he added. I can't think of a single hiker who wouldn't agree. Now the question is: how do we help communities and congressmen understand that hiking is viable adventure tourism? This trail is awesome. Go hike it. 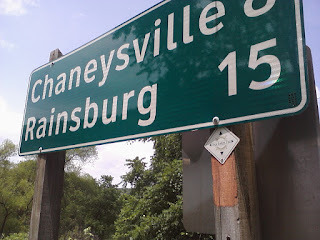 And when you spend money in town, make sure people know you're a hiker. Oh, hey! Guess which trail is listed on National Geographic's Best New Hikes? Some of the information is somewhat accurate. It would really be nice if articles about the GET actually featured a picture from the GET, though. I know, wishful thinking! Until that happens, I'll just be glad to see the GET getting publicity. It's a wonderful trail and was the best adventure of my life. 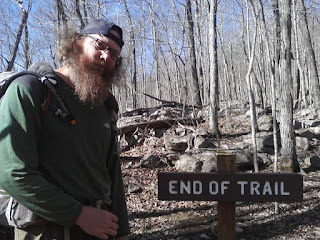 Last summer on my way home from the Appalachian Trail Biennial, I completed a spur trail of the GET that had haunted me since the 2013 thru-hike. On that late spring day in 2013, we had dry-camped the night before. 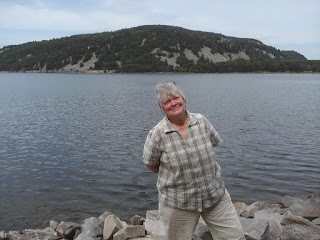 Water was an issue on the Shenandoah Mountain Trail, but even moreso that day: my water bladder had sprung a leak and I had no water. Zero. Nothing. When we got to this sign featuring a .5 (yes, it is point-five, the period is hard to see) spur trail to High Knob Tower, Bart and I knew that we just didn't have the water for a 1-mile roundtrip detour. 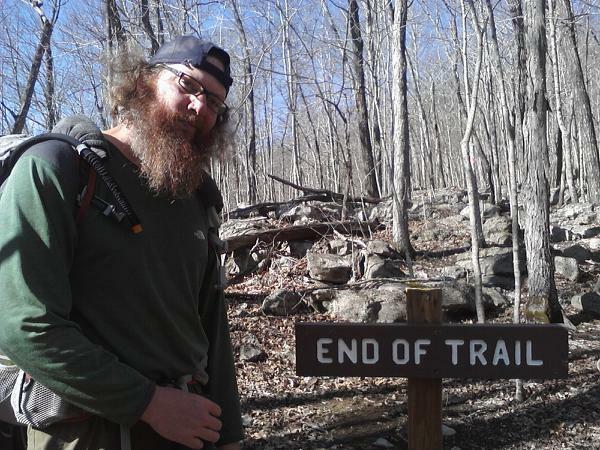 "It's a thru-hike, not a thorough hike," Bart pointed out, and I knew he was right. We kept hiking until we found water. Using duct tape and super glue, I fixed the water bladder while Bart sat in the dirt and beheaded woodticks. At that point, it was way too late to turn around to come back and hike the spur trail. We carried on. So last summer, I was pumped when my travel buddy/mother agreed to climb to High Knob Tower with me. The trail is marked with this lovely yellow i, sometimes moderately obscured but not too badly. The trail itself was in great shape. The .5 mile climb was brutal in the heat, but the views from the Tower made it worth it! 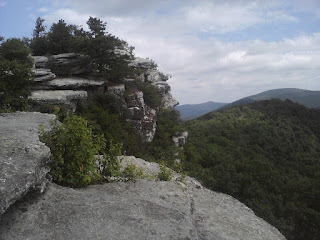 Views of Virginia and West Virginia made my heart soar. High Knob Tower is an amazing side trip on the Great Eastern Trail. I very much wish I could have enjoyed it during the thru-hike, but it probably meant more to me to visit it in 2015. 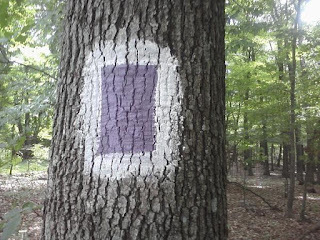 The only purple blazes on the Great Eastern Trail are on the western route of the bifurcation in Green Ridge State Forest. I visited the southern terminus of the Mid State Trail today. Why? 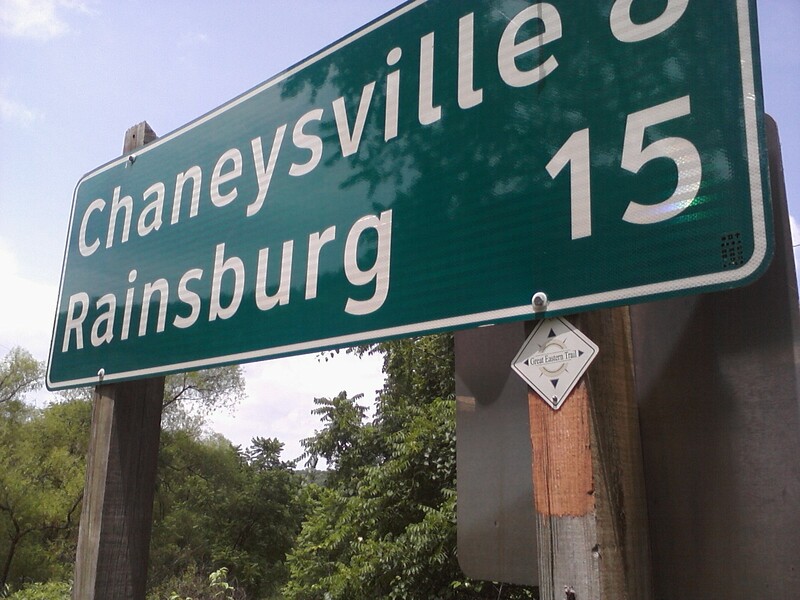 Because I was 3 miles from it and it's there.